If you’re time poor with a nursery that nags to be prepared for a pending arrival or perhaps decorating isn’t your thing – consider yourself rescued! Little Chipipi is making decorating all too easy with the introduction of Organic Baby – a gorgeous line of luxury baby linen. 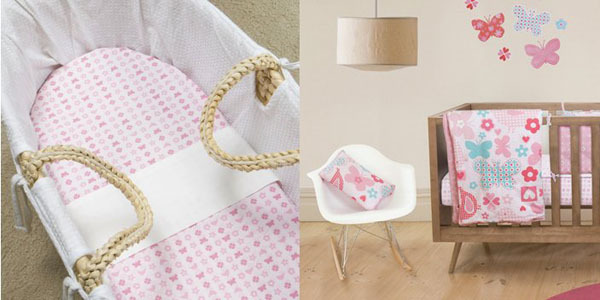 Organic Baby mix organic cotton with super sweet designs to create a perfectly peaceful space for any child. Everything you need from bassinet sheets right through to reversible cot quilts and accessories are available so you can match everything from start to finish if you so desire. Tweet Hearts in gorgeous pinks is super sweet for little ladies comes in a cot quilt, bumper, cot sheet set and bassinet sheet set. Pulling the whole look together is made even easier because all of this stunning 310 thread count luxury baby linen coordinates effortlessly with Little Chipipi Moveables wall stickers. How can decorating the nursery be any easier!? Organic Baby linen with prices starting at $89 and coordinating Little Chipipi Moveables wall stickers $79.95 are both available from Buyster, with delivery extra.